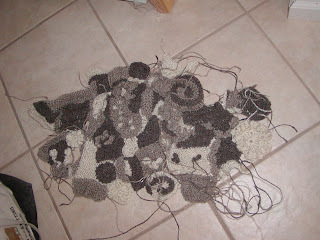 This is a work in progress of a scrumble, that I am planning to turn into a vest. It is a variation on three colors. 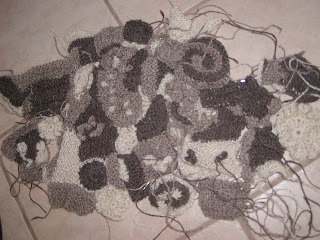 You need a basic knowledge of knit and crochet to do this. I am teaching it as a class on April 12, 2008, from 1-4 P.M. Cost is $40. You need to bring yarns, and needles and hooks that are the appropriate size for the yarns chosen. I cover the creation, assembly and embellishment ideas that will apply to anything that you decide to make as your finished project.